Kolkata: Zandu Realty Ltd has struck a deal with Sheth Developers Pvt. Ltd to rebuild erstwhile herbal healthcare firm Zandu Pharmaceutical Works’ headquarters in Mumbai’s Dadar neighbourhood into a 2.7-acre commercial complex. Zandu Realty recently assessed the value of its Dadar property at ₹ 250 crore. Going by Zandu Realty’s stock price of ₹ 1,482.70 on BSE on Monday, the market values the property at ₹ 119 crore. Zandu Realty is a shell company with only one asset and no liabilities. After acquiring the company from its founders for around ₹ 730 crore, Emami Ltd carved out and merged with itself Zandu Pharmaceutical Works’ herbal healthcare business. Emami is now cashing out of the fixed assets of the erstwhile herbal healthcare company. It has already sold its stake in Zandu Pharmaceutical Works in the market. From a peak of 72.8%, Emami pared its stake in the firm to 35.5%, making at least ₹ 200 crore from the sale of shares, according to stock analysts who track Emami. They did not want to be named. “From our studies, we concluded that we should build warehouses at our Dadar property," Agarwal said. “It will create for us a long-term revenue stream." Emami had earlier considered building a high-end condominium at the site. Ashwin N. Sheth, chairman and managing director of Sheth Developers, was more guarded. “The details of what we will build are expected to emerge in a month or so," he said, refusing to make any further comments. The restructuring of erstwhile Zandu Pharmaceutical Works has created a layered ownership structure, under which Emami owns shares in Zandu Realty indirectly through subsidiaries. The promoter group’s 35.5% stake in Zandu Realty is held entirely by Emami Rainbow Niketan Pvt. Ltd.
“The cash flow from the Dadar property will benefit shareholders of Emami, permeating through the holding companies, besides those of Zandu Realty," said Naresh Bhansali, Emami’s chief financial officer. The Emami group is currently restructuring its real estate projects, consolidating them into two listed firms—Zandu Realty and Emami Infrastructure Ltd—to focus on different segments of the business. 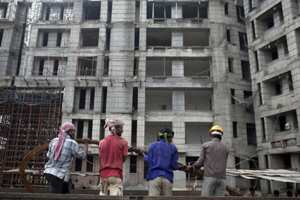 The company had said in September that three firms, Emami Realty Ltd, Emami Homes Pvt. Ltd and Emami Estates Pvt. Ltd, were to be merged with Zandu Realty.